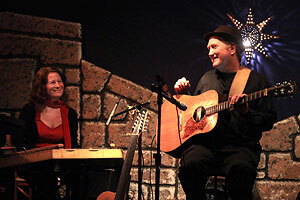 Welcome to the World Rhythms News, an infrequent newsletter dedicated to world music education. To subscribe, use the form below. Follow instructions thereafter, and make sure to check "World Music Education" in the "Interests" section of the sign up process. In Egypt, elzaffa, or wedding march, is a musical procession of drums. The main pattern is 8 beats long. After learning the traditional rhythm, check out Ancient Future's performance of Matthew Montfort's world fusion composition in this rhythmic mode, "El Zaffa." El Zaffa 4:26 (Matthew Montfort. © 2001 Ancient Future Music). iTunes. >YTmusic. Full version/best audio quality appears on Planet Passion (Ancient-Future.Com AF-2010) CD/Gift Card, $17.98: Buy CD Now. This workshop ending on the spring equinox 2011 is a great way to begin spring with improved timing skills. 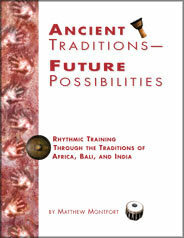 Matthew Montfort is the author of Ancient Traditions - Future Possibilities: Rhythmic Training Through the Traditions of Africa, Bali and India. The book, which is the basis for this world music workshop, received rave reviews in publications such as GUITAR PLAYER, ELECTRONIC MUSICIAN, DRUMS AND DRUMMING, and the SAN FRANCISCO CHRONICLE. Material from the book has been used by many teachers and musicians around the world, including Reinhard Flatischler, founder of the TaKeTiNa rhythm training process, and Steve Smith, famed jazz and rock drummer. Matthew Montfort holds a B. A. in World Music and Composition and an M. A. in Arts and Media Technology from Antioch University. A pioneer of the scalloped fretboard guitar (an instrument combining qualities of the South Indian vina and the steel string guitar), Montfort spent three months in intensive study with vina master K. S. Subramanian in order to fully apply the South Indian gamaka (note-bending) techniques to the guitar. His debut solo CD, Seven Serenades for Scalloped Fretboard Guitar was released in 2009 to rave reviews on Ancient-Future.Com Records. He has performed concerts worldwide, including at the Festival Internacional de la Guitarra on the golden coast of Spain near Barcelona. All compositions, recordings, video, and text in this article © 2011 Ancient Future Music. All rights reserved.